KUMARAKAPAY, Venezuela/CUCUTA, Colombia (Reuters) - Venezuelan soldiers opened fire on indigenous people near the border with Brazil on Friday, killing two, witnesses said, as President Nicolas Maduro sought to block U.S.-backed efforts to bring aid into his economically devastated nation. The United States, which is among dozens of Western nations to recognize opposition leader Juan Guaido as Venezuela's legitimate president, has been stockpiling aid in the Colombian frontier town of Cucuta to ship across the border this weekend. Maduro, who took power in 2013 and was re-elected in an election last year widely viewed as fraudulent, says opposition efforts to bring in aid are a U.S.-backed "cheap show" to undermine his government. The socialist president has declared Venezuela's southern border with Brazil closed and threatened to do the same with the Colombian border ahead of a Saturday deadline by the opposition to bring in humanitarian assistance. A fundraising concert for Venezuela, backed by British billionaire Richard Branson and featuring major Latin pop stars like Luis Fonsi of "Despacito" fame, attracted nearly 200,000 in Cucuta on Friday, organizers said. Some political analysts say Saturday's showdown is less about solving Venezuela's needs and more about testing the military's loyalty toward Maduro by daring it to turn the aid away. With inflation running at more than 2 million percent a year and currency controls restricting imports of basic goods, a growing share of the country's roughly 30 million people is suffering from malnutrition. Friday's violence broke out in the village of Kumarakapay in southern Venezuela after an indigenous community stopped a military convoy heading toward the border with Brazil that they believed was attempting to block aid from entering, according to community leaders Richard Fernandez and Ricardo Delgado. "I stood up to them to back the humanitarian aid," Fernandez told Reuters. "And they came charging at us. They shot innocent people who were in their homes, working." 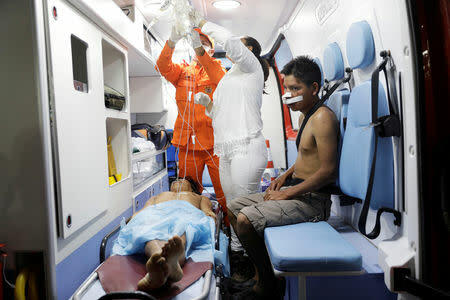 Seven of the 15 injured earlier on Friday were rushed by ambulance across the border and were being treated at the Roraima General Hospital in the Brazilian frontier city of Boa Vista, a spokesman for the state governor's office said. Venezuela's Information Ministry did not reply to a request for comment. Diosdado Cabello, one of the most prominent figures in Maduro’s Socialist Party, accused the civilians involved in the clash of being "violent groups" directed by the opposition. Venezuelan security forces have executed dozens and detained hundreds of others since protests broke out in January against Maduro's swearing-in, according to civil rights groups. The United States condemned "the killings, attacks, and the hundreds of arbitrary detentions", a State Department official said on Friday. The bloodshed contrasted with the joyous ambience at Branson's "Venezuela Aid Live" in Cucuta, where Venezuelan and Colombian attendees, some crying, waved flags and chanted "freedom" under a baking sun. "Is it too much to ask for freedom after 20 years of ignominy, of a populist Marxist dictatorship?" Venezuelan artist Jose Luis "El Puma" Rodríguez asked. "To the Venezuelans there, don't give up, the blood that has been spilled was not in vain". Earlier in the day, Branson held a news conference near a never-used road border bridge that has become a symbol of Maduro's refusal to let aid in after authorities blocked the bridge with shipping containers. "What we're hoping is that the authorities in Venezuela will see this wonderful, peaceful concert...and that the soldiers will do that right thing," Branson said. Guaido has vowed the opposition will on Saturday bring in foreign aid being stockpiled in Cucuta, the Brazilian town of Boa Vista and the Dutch Caribbean island of Curacao, setting up more clashes with Maduro's security forces. "You must decide which side you are on in this definitive hour," Guaido wrote on Twitter. "To all the military: between today and tomorrow, you will define how you want to be remembered." Guaido's move to assume the interim presidency and international backing has galvanized Venezuela's opposition, which has vowed to keep protesting until Maduro steps down. It previously staged major protests in 2014 and 2017 that waned in the face of government crackdowns. "The truth is that not even 10 concerts will make damned Maduro leave office," said Darwin Rendon, one of the 3.4 million Venezuelans to have emigrated since 2015 to find work. He sends what little he can earn selling cigarettes back to his family in Caracas. "This regime is difficult to remove," he added.